Earlier today, Warner Bros. Interactive Entertainment and DC Entertainment released a new trailer for Batman: Arkham City, showcasing the in-game appearance of Oswald Cobblepot, a.k.a. The Penguin. The trailer also showed a surprise appearance of Solomon Grundy. Well, just when you think that they couldn't cram any more into the Arkham City experience, it was confirmed today at Comic-Con that Talia al Ghul will be making an appearance in the game as well. For those of you out there asking who the heck Talia al Ghul is, here's the quick lowdown. Talia is the daughter of Ra's al Ghul, one of Batman's oldest and most dangerous foes. Under the guidance of her father, Talia has become a strong warrior in her own right, even leading the legendary League of Assassins in Ra's al Ghul's absence. Although she's fiercely loyal to her father, she's also fallen in love with Batman ... a feeling the Dark Knight has reciprocated many times despite their circumstances. In fact, in the current DC Comics continuity, Batman even fathered a child with Talia: the current Robin, Damian Wayne. So what role will Taila al Ghul play in Arkham City? And does this mean that her father (or even her son) are far behind? Who knows? But considering that Talia is still rumored to pop up in Christopher Nolan's upcoming Bat flick, The Dark Knight Rises, it's a safe bet that she'll do just fine under the light of the Bat-Signal all by herself. 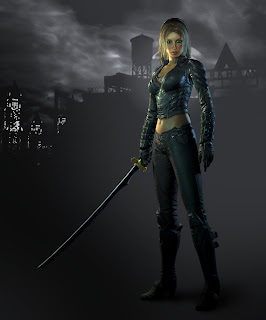 Giving a voice to Talia al Ghul in Batman: Arkham City is Stana Katic, best known as Detective Kate Beckett in ABC’s popular series (and a personal favorite show of mine) Castle. Katic's no stranger to dealing with superheroes either, having played as the superpowered spy Hana Gitelman in NBC's Heroes. Batman: Arkham City will be available in North America beginning Oct.18, 2011, for Xbox 360, PlayStation 3, and Windows PC. IT'S ALIVE!! ... and in 3D!! And I'll form the head!! Will Spock get a flight ring?